So you took a full-length AAMC practice exam. 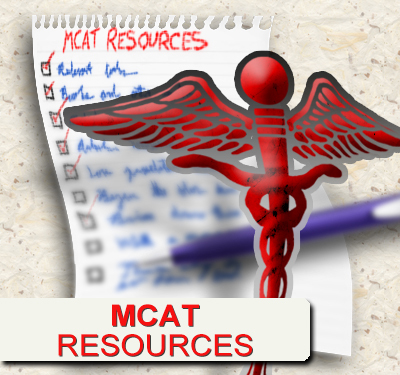 You may be thrilled with the results – or you may be far from your MCAT goal. Now what? Do you hit the books again and memorize the answers to every question you missed? 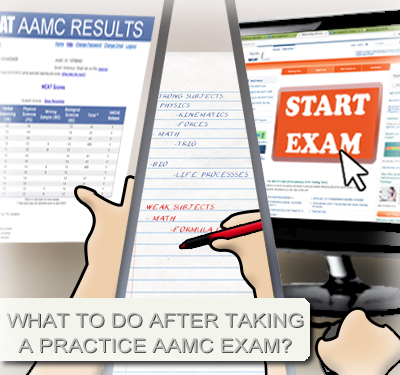 If you analyze your practice AAMC exam results correctly, you will know exactly where to focus your upcoming efforts. It can take more than one exam analysis to identify your weak areas, but once you nail it, you will know what to do to break out of your potential score plateau. It takes about a week to properly analyze and utilize your practice exam results, so DON’T schedule your practice exams back to back! These techniques will also apply to non-AAMC exams, however keep in mind that every test-prep company is different and their scores may not match up to your AAMC scores. How Did You Do Overall? How does your overall practice score compare to your desired score? What about the individual sections? What factor made you lose points? Different students will lose points for different reasons. I’ve compiled common weak areas: look at them all, but focus on the areas that apply to you. Believe it or not, this is a big issue for some students. Don’t approach the exam with fear. Do what you can prior to the exam to relax and elimination distractions. For example, eat a good meal, study somewhere you won’t be disturbed, and of course, shut down all your electronic devices. Also, don’t take your practice exam at the end of a long and tiring day. The MCAT is long and intense, and you will need all the brain power you can get. While I always recommend taking a diagnostic test as soon as you start studying for the MCAT, you shouldn’t take it 100% blind. Be sure you know what to expect in each section including subject material, passage distribution and yes, even breaks. This is one of the most common issues with the MCAT, especially for beginners. You may not know what to expect, find it difficult to read and concentrate, or have poor reading skills. Practice increasing your reading speed. Learn to triage each section so that if you run out of time you only suffer a minimal loss of points. If you find yourself reading too slowly or have trouble concentrating, PRACTICE READING. Pick up a big fat boring newspaper and devote ~45 minutes to reading at the start of every day. Your brain may hate you but it will get easier with time. If difficult passages slow you down, skip the hard ones. Focus on maximizing points for easier passages, and return to the tough one if you have time. If you run out of time and have 2 minutes left, just guess on any skipped question. Any answer is better than no answer. Assuming your goal is a 9-12 per section, it’s ok to miss a few. May as well guess on the hard ones. When reading passages, you may find yourself wondering what on earth they’re talking about. If this happens in just a few passages, skip it and come back if you have time at the end. But if you find yourself confused by all the reading passages, then you need to just get into the habit of reading ‘long and boring’ articles. Your approach to reading passages also matters. Some test-prep companies will recommend a very time-consuming strategy of passage mapping and paragraph outlines. I personally find those to be a waste of precious time. Understanding passages comes from practice and exposure to the material. It also comes from strategic reading. I teach my students to skim the science passages for the big picture and to get an idea of what is mentioned in each section. Once you start on the questions, if they require information from the passage, you already know where to go back and find it. In addition, as you study and prepare, don’t just focus on questions; try to focus on passage based practice tests as well. This is THE MOST COMMON issue for students scoring in the teens and low 20s. As you review your exam, you’ll notice trends. You may have felt weak in a certain topic but gotten all those questions correct. You may have thought you mastered another topic but somehow missed all the those questions. If you don’t know a topic well, you will not be able to answer the questions. Spend time reading, learning, and truly mastering the material. Focus on content, concepts, equations, and the big logical picture. and most dangerous: questions you didn’t know and got correct. The latter is most dangerous, as it may give you a false sense of confidence for a topic you really need to go back and review. 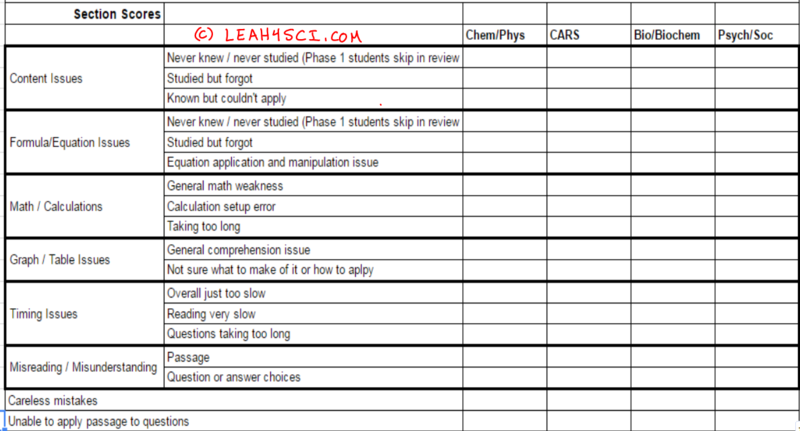 You’ll use this list to formulate your study plan for the next 3-5 days. Reread each question and see why you missed it. Was it a concept, interpretation of concept, careless mistake or perhaps a faulty calculation? Read through the correct answer and explanation so you understand why the correct answer IS the correct answer. Understand why you got it wrong. Put whatever concept you don’t know on your study list. Let’s say you missed a pH question relating to the titration of a weak acid solution at its equivalence point. You should understand the concept of pH, titrations, and equivalence points. But you should also understand which species are present in solution and what determines the concentration of H+ and OH-. Add “titrations of weak acids/bases” to your study agenda. Your goal here is to identify the specific topic you have trouble with. It’s not just acids and bases, but more specifically titrations. Do this for every single question. Once you have a complete list of topics, set aside 20-30 minutes FOR EACH TOPIC to review and truly understand everything about the topic you missed. If you find you’re really weak in a topic, take all the time you need to be prepared for the next practice exam. It’s ok to take another practice test even when you’re not finished fully studying. Don’t wait till you feel you’ve covered EVERYTHING to test again or that second practice test may never happen. 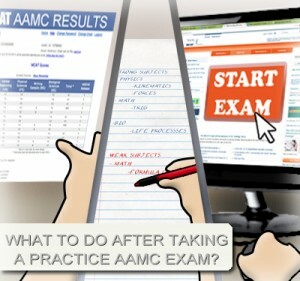 Taking a full length AAMC exam is a good way to experience the actual MCAT while assessing where you stand compared to your goals. But don’t stop once you see your score! Use your practice exam analysis to create a topic list and focus your continued studies to ensure you get onto and remain on the right track to success. thank you soo much for all your valuable advice. You’re welcome Mari. When are you taking your MCAT? How do you go about and review the verbal section? I’m publishing a post on that later this week. Are you subscribed to my email newsletter? Love this post! Is there an article on how to review verbal? Hello, I am not doing well at all. I feel I need more content review, but I only have 2 months left for the real MCAT. When I take test, I feel difficulty answering every question, most of time I forgot what I learned, and run-out of time. I read all your technique and strategy, and highly appreciate you for providing such valuable information. Is there any way I can do well and catch-up, because I only I have 2 months leff? 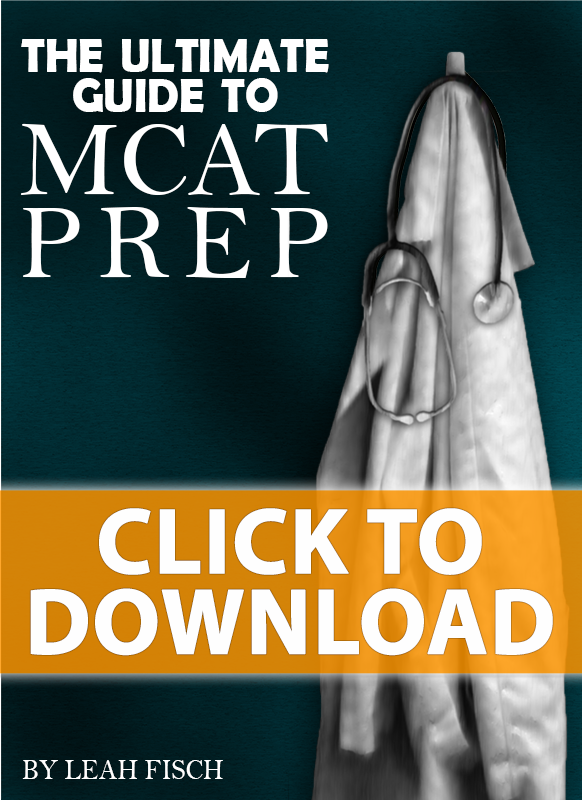 I do not want to re-take it since MCAT format will completely different from 2015. Your personalized-technique and invaluable advice will be highly appreciated. Do you provide tutoring? Do you think I need extra help to catch-up? Please advise me, thanks again, l will look forward to hearing from you.